CHAPEL HILL, NC; January 27, 2015—Tantrums, irritability, self-injury, depression, anxiety. These symptoms are associated with autism, but they're not considered core symptoms of the disorder. Researchers from the UNC School of Medicine are challenging this assertion. They have used functional MRI to show that - when it comes to the ability to regulate emotions - brain activity in autistic people is significantly different than brain activity in people without autism. The findings, published online today in theJournal of Autism Developmental Disorder as part of a special issue on emotion regulation, suggest that improving prefrontal cortex activity could directly help autistic people regulate their emotions and improve serious symptoms associated with the disorder, which affects millions of people in the United States. The discovery shows that "emotion regulation" symptoms have a biological explanation that can be visualized using fMRI. The symptoms do not seem to be merely associated with or a result of the core autism symptoms, which include repetitive behaviors, verbal and non-verbal communications problems, difficulties with social interactions, and other cognitive issues. Gabriel Dichter, PhD, associate professor of psychiatry and psychology and senior author of the paper, said, "This research adds to the growing awareness that although autism is diagnosed on the basis of social impairment and repetitive behaviors, the importance of emotion regulation and all the behaviors that come with it - depression, tantrums, meltdowns, irritability - are very real and should be a focus of clinical services." "Any parent of a child with autism knows that these symptoms can be pervasive," added Dichter, who is a member of the Carolina Institute for Developmental Disabilities. "Children with autism often lack the ability to cope with difficult emotional situations that result in meltdowns and tantrums." There are only two FDA-approved medications to treat autism and neither treats core symptoms; they treat high rates of irritability and aggression. "We've known for a while that we need to pay attention to emotion regulation in people with autism," Dichter said, "but we think these data suggest a neural basis for these problems and add credence to their ubiquity as core features of the disorder." The Carolina Institute for Developmental Disabilities, directed by Joseph Piven, MD, is the umbrella program for autism research at UNC, which ranked second worldwide for the number of autism-related scientific papers published in 2012, the last time an intergovernmental agency issued the ranking. The institute has a registry of more than 5,000 families with members who have been diagnosed with autism. For this study, Dichter's team recruited 15 controls and 15 young adults, age 18 to 30, with autism. Because it is well documented that people with autism often have trouble regulating their emotions, Dichter's team spent 45 minutes with each participant to teach them how to change their perception of an emotional stimulus before they entered the MRI scanner. During the study, while in the fMRI scanner, each participant viewed a series of pictures of human faces with no expression. Partway through viewing each picture, participants were asked to generate positive thoughts about the picture, or generate negative thoughts, or leave their emotional response unchanged. The researchers also used eye-tracking methods to ensure all participants continuously viewed the picture and to measure at high resolution the size of each participant's pupils. It's known that pupils dilate when people exert cognitive effort, such as trying to recall someone's name or trying to change an emotional response to situation. These methods, along with self-reporting from participants, created checks and balances that ensured the accuracy of the data they collected from brain scans. They found that in the control group, the prefrontal cortex worked hard to modulate the emotional response that originated in the limbic system - an evolutionarily old part of the brain associated with basic emotions and needs. This confirmed what other research had shown. The brain scans of people with autism were different. "The prefrontal cortex did not come online to the same extent," Dichter said. "It was as though the brain region that's needed to work hard to regulate emotional responses couldn't activate to the same degree as it did in people without autism. This limited activation of the prefrontal cortex, not surprisingly, resulted in less modulation of the limbic regions." The pupil data suggested that participants worked hard to fulfill the requirements of the study. They changed their emotional responses to the picture. But their brain scans suggest that people with autism did not use their prefrontal cortex to the same extent as people without autism. 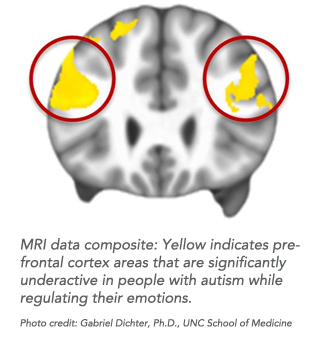 Thus, when faced with emotional situations, people with autism do not use their prefrontal cortices to regulate emotions to the same extent as people without autism. This in turn may lead to the "associated symptoms," such as anxiety, tantrums, and irritability, which can be pervasive. Dichter's team also found a correlation between the level of brain activity in the prefrontal cortex and the severity of a person's autism. "There does seem to be an association between the ability to bring these brain regions online as needed during emotional situations and the severity of a person's autism symptoms," Dichter said. Next, Dichter wants to conduct a similar study with children. "Studying children with autism helps us tease apart the effects of having autism from the affects of living with autism for years as a teenager and an adult." Future intervention research based on these findings could use cognitive behavior techniques to improve emotion regulation abilities for people with autism or brain stimulation techniques to improve activity in the prefrontal cortex during emotion regulation. “Neural Mechanisms of Emotion Regulation in Autism Spectrum Disorder,” J. Anthony Richey, Cara R. Damiano, Antoinette Sabatino, Alison Rittenberg, Chris Petty, Josh Bizzell, James Voyvodic, Aaron S. Heller, Marika C. Coffman, Moria Smoski, Richard J. Davidson, Gabriel S. Dichter. Journal of Autism and Developmental Disorders 25 Jan 2015. Press materials provided by University of North Carolina Health Care.